Very enjoyable for all the family members, the staff were exceptionally friendly and helpful. The location is great, so central and we shall tell our friends all about Alto. Fantastic. My booking was made for me (by a company), and on arrival we realised they had not updated my booking to include my two children. The hotel staff were very accommodating, and sorted it out no fuss. What could have been very stressful was not. They were very professional and helpful. Room was perfect, and breakfast lovely. Thank you! Ideal location. Comfortable beds. Quiet. Very friendly and helpful staff. Definitely rebooking for our next visit. Ticks all the boxes. Found the hotel on trip advisor two or so years ago and have stayed with you five or six times. Only problem I have had is that often have an issue with internet access on an IPAD and this was a big issue this time, but when I mentioned it there was already a workmen looking at it and it was fixed after that. It's still an issue that it logs you out after each use even if you hit the "remember password' button and its a pain to keep having to re-enter the password etc but that's a small issue. Some of the rooms have very little natural light which would be difficult for longer stays. We are currently upgrading WiFi network which will resolved log out and back on issues. A place to look forward to returning after a day walking around a cold and wet Melbourne and have a hot chocolate as soon as you get inside. As always, really wonderful front desk team, as well as other staff I bumped into. Nice stay and the extra $40 for the front room is worth it. My second stay - and as enjoyable as the first time. I initially booked the spa apartment and then changed it to a one bedroom apartment after being advised that the spa apartment was not in line with my request to be at the back of the hotel and away from the lift. Thank you to the staff member who alerted me via email when I booked. The change to another room made my stay very pleasant. The location is a bit out of the way for some things but the bonus was being so close to the station with my luggage and just being able to walk over when I felt like it to catch the bus back to the airport rather than waiting for a shuttle. Very pleasant, so central and easy to reach. Good kitchen, comfortable beds. I thoroughly enjoyed my stay at Alto Hotel On Bourke. I would recommend the hotel to anyone visiting Melbourne. The service was excellent and staff were very professional and friendly. It really was a pleasure to stay at the Alto. Very Comfy beds! Thanks for the bike storage as well! Excellent location (next to the main station and between the City and the Docklands), very friendly and helpful staff, nice / big / clean rooms. Happy with everything - except the radio. I do like to listen to the radio and inevitably it is very difficult to do in hotel accommodation. I really liked the book swap, the apples, honey on the roof etc. In additional to the bedside iPod /iPhone players and charger that also plays FM radio has an alarm function our new LED HD televisions have some radio channels as well with excellent reception. Great hotel. Ticks all the boxes. Problem with air conditioning received personal attention from the manager which pleased us very much.Not completely fixed but not for want of trying.Otherwise enjoyed our stay immensely (as always). We love the Alto. Small enough to be cosy and friendly but still very professional. 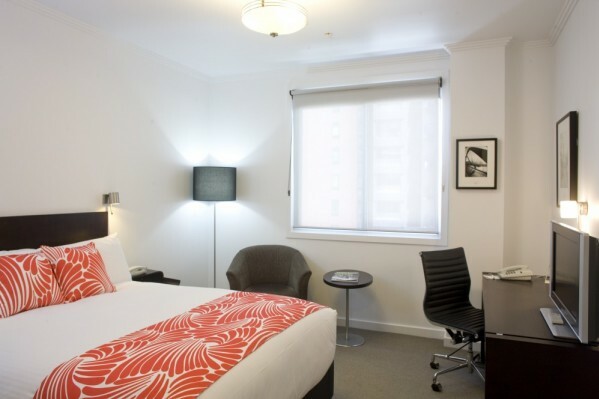 We would always choose to stay at the Alto when visiting Melbourne. We honeymooned with you in 2008 and were excited to return this year. A bonus this year was the lovely breakfast. Well done on all your environmentally touches too. See you next time we head for lovely Melbourne. A very well run and welcoming hotel. Comfortable beds and quiet rooms. The rooms have everything necessary for an enjoyable stay. The room with a kitchenette is ideal. There is a good choice for breakfast which is very efficiently served. Enjoyable, good location. Suited us perfectly. A comfortable hotel where you get what you pay for. The Bed & Brekkie deal was great & brekkie was awesome! Best of all, a really comfy bed. We love Alto and have been guests twice now. We love the eco emphasis in the running of the hotel, its location and ambiance. The staff are friendly and helpful too. This last stay getting internet access was frustrating at times. Other than that, very enjoyable. Loved it. Service was fabulous and to be commended. Loved the eco philosophy. The only very minor issue we had was rectified promptly and more than compensated for. Husband was a little bothered by the street noise on Saturday night but that is locational, and hardly something you can control. You will definitely be the first on my list when we next visit Melbourne. It was a good find. Very friendly staff, good room - v small but I knew that when I booked it. Breakfast was excellent and reasonably priced. Our staff enjoy getting feedback about their service, thank you. Breakfast is an important meal and we realise that guests expect not to be overcharged for breakfast. As you say the petite rooms are just that compact but with all the amenities you need. We have stayed at Alto a few times over the past few years and it always feels like home. I do prefer the 2 bedroom apartments and 1 bed apartment from the studio, but it suited us fine without the kids. I was a bit disappointed with the wines as 3 out of the 4 reds I tasted were ordinary and I don't get to drink much red in the heat up north! Otherwise, we will be back. We all enjoyed our stay at The Alto on Bourke. All the staff were so friendly and helpful,from the front desk, restaurant and housekeeping. As out of state visitors ,the location was perfect as it a short stroll from the Skybus, train station and tram stops . The quality of the room was exceptional ,the beds were comfortable , bathrooms very modern and the kitchen was lovely. We all enjoyed the breakfasts and they were also good value. The touches such as apples in the foyer , the reading nook and relaxation room made this stay memorable. I have already recommended the Alto to my family and work colleagues. Many thanks , you have a well run hotel. Fantastic, we had a very pleasant stay and the staff and pamphlets were all very handy. Very clean and it was nice to stay in a hotel where you felt the room was actually fully equipped and functioning. Only wish was that room service was available on weekends, but that was only because the weather turned bad! Overall, a fantastic hotel! Very homely, warm and comfortable. We felt at home and loved the coffee, dining breakfast area. The location is excellent and quiet too, the beds were very comfortable. We had a wonderful experience at the Alto and will stay there again. Brilliant stay, fantastic staff, great service, real value for money. Very nice hotel, convenient to bus station and hence airport. Had everything you could want. Loved the fact it is an eco friendly hotel!! Excellent stay. Staff very friendly, helpful. Cooked breakfast great with good selection. Everyone extremely helpful and friendly. Room service great. Rooms cleaned at convenient times - able to sleep in with no interruptions, rooms serviced whilst out. Rooms cleaned to a high standard. Perfect location close to everything in the cbd with tram stop at the front. loved it, central, would come back.